History - When was the Great Pyramid built? Who built the Great Pyramid at Giza? History - Why was Great Pyramid built? What is inside the Great Pyramid? The Great Pyramid have amazed people throughout the centuries. Who built the Great Pyramid? Why was it built? How was it built? What was the purpose of the Great Pyramid of Giza? What was inside the Great Pyramid of Giza? These are just some of the many questions which surround the Great Pyramid of Giza. The Great Pyramid is located on the Giza Plateau, bordering the Sahara Desert, on the west bank of the Nile River, near modern-day Cairo. The Great pyramid was originally 481 feet high and 755 feet wide, dimensions which the damage of time have reduced to 454 feet and 750 feet respectively. The true history of the pyramids have been lost over time. It is not certain exactly why the Great Pyramid was built but many Egyptologists believe that the reason for its construction was linked the religion and beliefs of the Ancient Egyptians. The early Egyptian priests evolved a creation myth, called the Cosmogony, to explain how some of their Gods came into being. The Sun God Ra (as Atum) was believed to have risen from the primeval ocean to a conical-shaped mound of earth and then created the world. The Ancient Egyptians therefore revered the mound as an image of creation. The first rays of the sun fell on Sun God Ra (as Atum) marking the way to heaven by ascending the rays of the sun. The Great Pyramid consisting of mounds of masonry was a material representation of the rays of the sun. It is easy to imagine how Ancient Egyptian priests would see the association of the pyramid and the sun and how the structure could be a means whereby a dead king, such as the Pharaoh Khufu, could ascend to heaven. The sun lead the way to the heavens but where was the final destination? The most important group of stars to the Ancient Egyptians were called the 'Indestructibles' (in the bowl of Ursa Minor & Ursa Major). The Indestructibles were the two bright stars that always could be seen circling the North Pole. These stars circled an unmoveable area which the Ancient Egyptians believed was heaven. The positioning of the Great Pyramid was of great importance as it was built to align north with a single, perfectly aligned vent, or shaft which was built into the internal structure of the Great Pyramid pointing directly to the area the Ancient Egyptians believed was heaven. The shaft led, at an angle, from the burial chamber to the outside. The soul of the Pharaoh Khufu was thus able to travel from the burial chamber in the Great Pyramid, up the shaft, on the path to heaven. 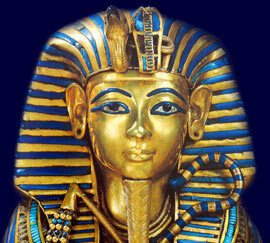 The Pyramids were therefore believed to be Resurrection machines - a 'Stargate' leading to heaven and eternal life. Of the Seven Wonders of the World the Great Pyramid of Giza is possibly the greatest of them all. It presents many other marvels besides its longevity and size. First, there is the massiveness of the stone blocks of which it is composed. The basement stones are in many cases 30 long by 5 feet high, and 4 or 5 wide: they must contain from 600 - 750 cubic feet each, and weigh from 46 to 57 tons. The granite blocks which roof over the upper sepulchral chamber are nearly 19 feet long, by two broad and from 3 to 4 deep. The relieving stones above the same chamber, and those of the entrance passage, are almost equally massive. Generally the external blocks are of a size with which modern builders scarcely ever venture to deal, though the massiveness diminishes as the pyramid is ascended. The bulk of the interior is, however, of comparatively small stones but even these are carefully hewn and squared, so as to fit together perfectly. One lies deep in the rock, about 120 feet beneath the natural surface of the ground, and is placed almost directly below the apex of the structure. It measures 46 feet by 27, and is 11 feet high. The access to it is by a long and narrow passage which commences in the north side of the pyramid, about 70 feet above the original base, and descends for 40 yards through the masonry, and then for 70 more in the same line through the solid rock, when it changes its direction, becoming horizontal for 9 yards, and so entering the chamber itself. The construction of th King's Chamber, the very kernel of the whole building, is quite remarkable. It is a room of 34 feet in length, with a width of 17 feet, and a height of 19, composed wholly of granite blocks of great size, beautifully polished, and fitted together with great care. The construction of the roof is particularly admirable. First, the chamber is covered in with nine huge blocks, each nearly nineteen feet long and four feet wide, which are laid side by side upon the walls so as to form a complete ceiling. Then above these blocks is a low chamber similarly covered in, and this is repeated four times; after which there is a fifth opening, triangular, and roofed in by a set of huge sloping blocks, which meet at the apex and support each other. The object is to relieve the chamber from any weight, and prevent it from being crushed in by the mass of material above it. The entire chamber, with its elaborate roof, remains intact, without crack or settlement of any kind.